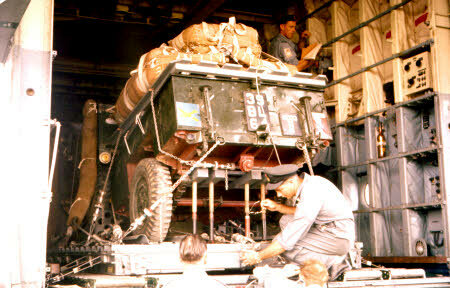 LEFT: A Land Rover and Trailer on a MSP (Medium Stressed Platform), loaded and Lashed down. This was during the days before Side Guidance made an appearance, so wire strops were connected to 10,000lb strong points to lash the platform down. ABOVE LEFT: . 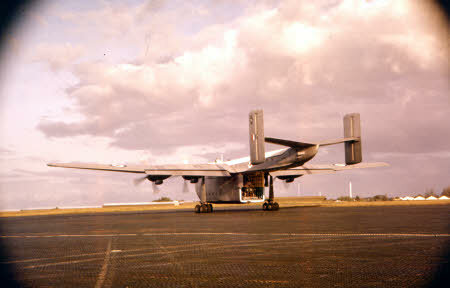 Carrying out final checks to the platform ABOVE RIGHT: XB 260 taxiing out. 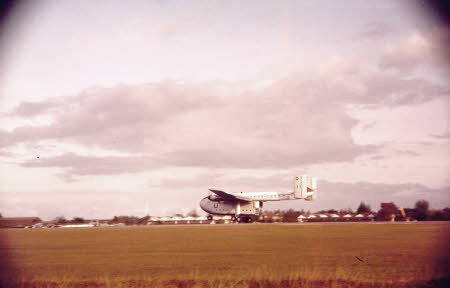 ABOVE LEFT: XB260 takes off for the drop. 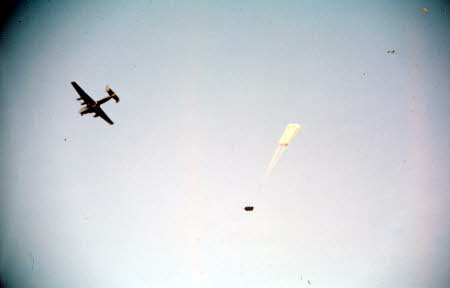 ABOVE RIGHT: The extractor parachute deploying behind XB260. 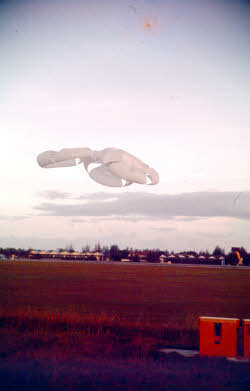 ABOVE: The platform has left the aircraft and the pull of the 10 foot Ring Slot Extractor Parachute has been transferred to the parachute bags to pull the parachutes out. 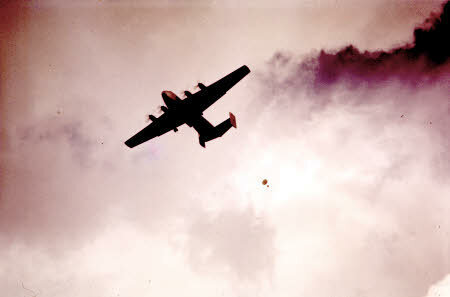 ABOVE LEFT: The parachute bags have been pulled off and the parachutes are streaming, held closed by the de-reefers. 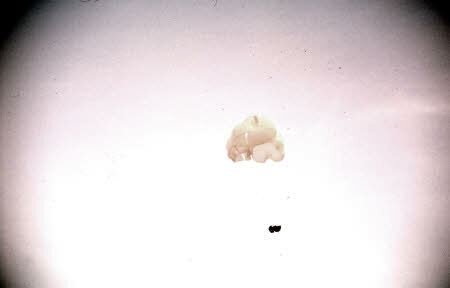 ABOVE RIGHT: The de-reefers have released and the three 66 foot parachutes are opening. 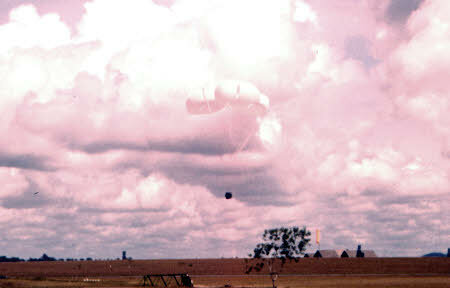 ABOVE LEFT:The timers have released the air filled shock-absorbing bags. 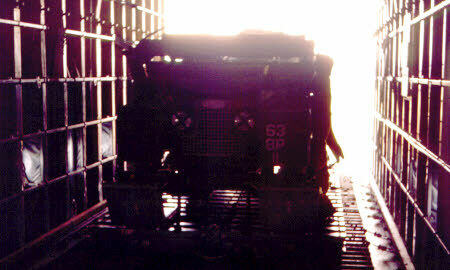 below the platform. ABOVE RIGHT: Almost down. 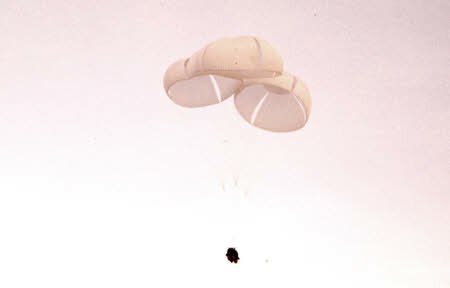 ABOVE LEFT: The platform has landed and the parachutes will automatically disconnect from the platform. ABOVE RIGHT: Job done. 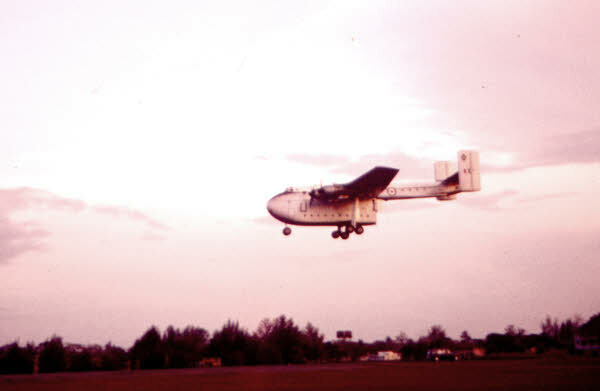 XB260 lands at Seletar.